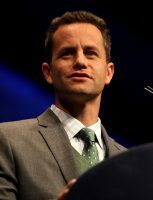 Kirk Cameron was recently in Florida and took the time for a short video at the Orlando airport to give an update on his travels and express a thought he had about the coming Hurricane. [My friend] you know, says [Hurricane] Harvey was a once in a lifetime event because the destruction was unprecedented with that hurricane. There’s another one coming up that they say is the largest recorded hurricane on the Atlantic, and the devastation from that, we don’t know how much it’s going to be. But, how should we look at two giant hurricanes coming back to back like this. Do we write it off as coincidence or statistical anomaly? Cameron then encouraged people to pray for Floridians.